To provide the client with a top quality product, with every detail thought out, which will stand the test of time against the changing conditions of this New England climate? 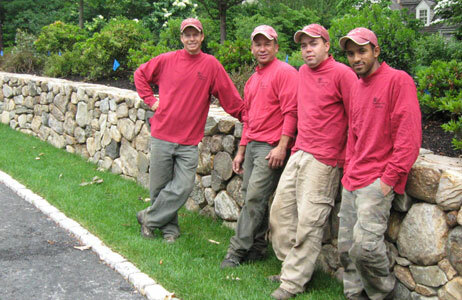 Landscaping in New England poses challenges when dealing with frost, snow, ice, deluge and drought. These conditions need to be taken into account even before starting a project on a beautiful sunny day in June with no wind. The goal is to provide you with an attractive landscape that suits your needs and leaves no room for future problems. It takes an experienced contractor to foresee problems before they occur, and with 24 years in the industry you will benefit from that experience. Countryside Tree & Landscape follows no specific design style other than function. Each property has its own individual characteristics and the owners have their own likes and dislikes, combining the two to create a desirable landscape is our main goal bringing form and function together. Every aspect of your landscape is coordinated and crafted by the Countryside team, assuring that all pieces of the project (tree work, hardscape, softscape) come together seamlessly, thus resulting in a quality finished product. I started my career at the young age of 14 mowing lawns and spreading mulch after school and on Saturdays. Upon graduating from Needham High School I continued my education at the Stockbridge school of Agriculture at UMASS Amherst completing my associate’s degree in Arboriculture and Park Management. Shortly after graduating from the University I passed my certification as a Massachusetts certified Arborist. Poised for the work force I officially began my career as a member of the tree and landscape community. While honing my skills as a foreman on a tree crew I also handled site work, hard scape and soft scape on many construction projects over an eight year period. With growth slowing down and my hunger for perfection growing stronger it was decided that 1999 would be my last year as an employee, and the Millennium would be the birth of Countryside Tree & Landscape. To legitimize the business, Countryside Tree & Landscape became incorporated just one year after its inception. Year after year, even through difficult economic cycles, Countryside Tree & Landscape continues to grow and prosper. Countryside Tree & Landscape Inc.